Description: BNSF westbound freight crossing bridge 2 in Abo Canyon, last unit is unidentified. Description: Still says "Santa Fe" on the nose band. Description: I personally don't care for the BNSF font on these war bonnet locomotives. Description: BNSF Westbound Vehicle Train passing through Scholle, NM. 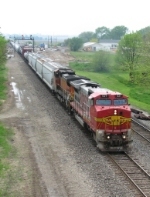 Description: Warbonnets rumbling west bound thru Galesburg IL. Description: BNSF 521 in Warbonnet paint , rare for this area. Description: Garbage train making a double over at Bridge 37. Description: In a A-B lash-up, a loaded auto train heads west near White Deer, TX. 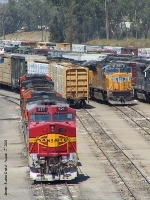 The BNSF 521 was built as Santa Fe #521 in October 1990 and the BNSF #338 a GP60B was built as Santa Fe #338 in July 1991. Description: A decent looking warbonnet trails todays Pig Train.